Hardcover, 9.75 x 11.75 in. / 632 pgs / 672 color / 166 bw. 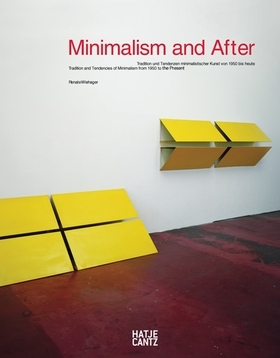 First published in 2006, and soon out of print, Minimalism and After is a now classic presentation of Minimalist and Postminimalist tendencies from the 1960s to the present day. The images in this hefty volume track some of Minimalism's major contributions: the essentially sculptural presence of the picture-object, coolly geometrical structures, works presented so that they relate to the space and the viewer, and a rejection of symbolic or narrative material. In-depth entries treat 190 artists, including 40 who were not included in the 2006 edition, and provide some 600 images of their work; those covered include established artists like Michael Heizer, Dan Graham and Robert Ryman and some of the younger crowd, including Liam Gillick and Michael Zahn. A new essay by Renate Wiehager offers a European account of the century-long development of abstract art from Adolf Hoelzel's 1906 class at the Stuttgart Academy to the present. FORMAT: Hbk, 9.75 x 11.75 in. / 632 pgs / 672 color / 166 b&w.